If you use Internet Explorer in Windows then you must have encountered This page can’t be displayed error once in a while. The page cannot be displayed is a very annoying error in IE 10 or IE11 in Windows 8.1 and Windows 10. When encountering this error you won’t be able to browse to a particular site or all sites on the internet. Internet Explorer may not be the preferred browser for some users but it is an essential and must have browser. This is because there are some websites and programs that works better only with Internet Explorer and it is also good to have Internet Explorer for troubleshooting issues. This page cant be displayed error can occur because of various reasons and here in this post I will tell you on how you can solve this annoying error in Internet Explorer. Here are the various fix to solve the page cannot be displayed error in Internet Explorer in Windows. The first thing you should do when you encounter “this page can’t be displayed” error is to check whether your internet is working fine or not. You can try loading some sites on other browsers such as firefox and opera to test your internet. If the sites are opening well and good in other browsers then it means you internet is working well and there is some issue with your IE settings. If your Internet is working fine and you are getting the page cannot be displayed then move to the next step mentioned below. If you are getting this error when the site is up and its servers are running fine then you can move to the next step mentioned below. Clear and remove all the browsing history & cache including temporary internet files, cookies, ActiveX Filtering and Tracking Protection data etc. 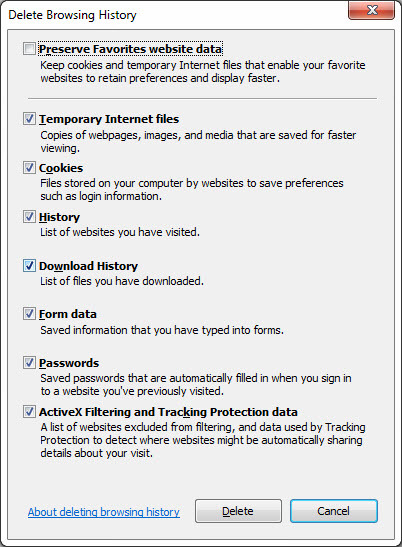 To clear cache and browsing history go to Tools->Internet options->Browsing history->Delete. Here check all the options except Preserve Favorites website data and then click Delete. After that restart your Internet explorer browser and begin surfing. If the page cannot be displayed error is still showing up then move to the next step mentioned below. TLS (Transport Layer Security) & SSL (Secure Sockets Layer) are security or cryptographic protocols that provide an additional layer of security to the website communication over network. It may be possible that the website you are trying to open has TLS & SSL implemented but they are disabled in your browser. So to enable them go to Tools->Internet options->Advanced. Here scroll down to the end and then enable or check all the SSL and TLS options available there. After that click on Apply and OK. If this also doesn’t solve your problem then move on to the next step mentioned below. Some Add-ons and Extensions can cause “This page can’t be displayed” error in IE 11 or previous versions. To disable addons go to Tools->Manage Add-ons and then disable the addons that you think are causing this error. You can also disable all the addons one by one to figure out which one is causing the problem. If the error is still there then follow the next solution mentioned below. 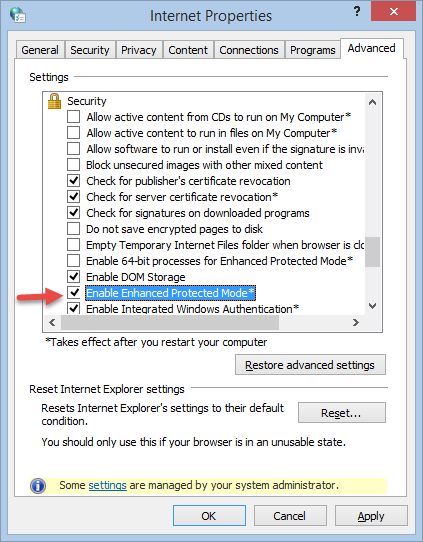 EPM or Enhanced Protected Mode is a security feature introduced in Windows 8. EPM disable all the add-ons such as toolbars, browser helper objects (BHOs), and extensions in Internet Explorer that are incompatible with it. By default EPM is tuned Off in IE but you can enable it by going to Tools->Internet options->Advanced. Here scroll down and check Enable Enhanced Protection Mode. After that click OK and restart the browser. If this fix also doesn’t solve the page cannot be displayed problem then move to next step. Some SSL sites do not open when your system Date and Time is incorrect and in some cases it can lead to This page can’t be displayed error so make sure that the date & time in your windows is set correctly. If the date and time is getting incorrect regularly when you restart your computer then it means you CMOS battery is dead and you have to replace it with newer one. Using Proxies is one of the major causes for “This page can’t be displayed” error In Internet Explorer in Windows. 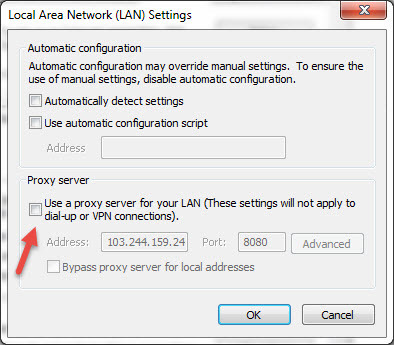 Here you should disable proxy in Internet Explorer by going to Tools->Internet Options->Connections->LAN settings and under Proxy server uncheck Use a proxy server for your LAN option. If you using a dial-up internet connection then do the same under Dial-up and Virtual Private Network settings by clicking the Settings button. If you have any kind of proxy software installed on your computer then uninstall it completely and then reboot your computer. After that check the site in IE and If error persists then move to next step mentioned below. 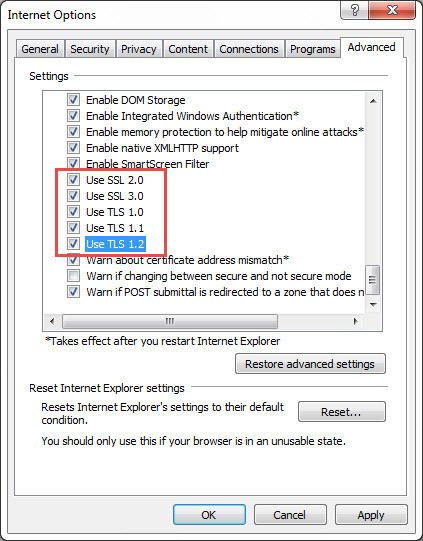 Misconfigured settings in Internet Explorer due to any program or virus can also lead to webpage cannot be displayed issue in IE. Here you can Reset settings to default for Internet Explorer. You can reset internet explorer by going to Tools->Internet options->Advanced and in under Reset Internet Explorer settings click Reset to Reset Internet Explorer’s settings to its default settings. You can also Reset it if the browser is unstable. If this also doesn’t solve your problem and go to next step mentioned below. Internet Explorer is not a very secure browser and it is generally vulnerable to viruses and malwares. So if your Internet Explorer browser is infected with any kind of virus or malware then you may face “This page can’t be displayed” in Windows. You can use the tool HiJackThis (HJT) to inspect the problem. For removal of malware you can use Malwarebytes Anti-malware tool. You can also try using Public DNS Servers like Google DNS or Open DNS for this page cannot be displayed error. Go through the guide below for changing DNS servers in windows. I have listed down all the possible solutions for “This page can’t be displayed” error that occurs in IE. Using the above mentioned one or more solutions you can surely fix this annoying error. If you have anything to ask or want to suggest something then you can do so by leaving a comment below. Thanks Tayyab for your kind words. Also please keep visiting and share this blog with your friends.